From time to time most of us look at our clutter and decide to have a "Spring Clean". You may have an old SLR camera that you never use and be tempted to donate it to your local charity shop. However, before parting with it why not try taking a few shots of the night sky, you may be pleasantly surprised! To encourage us to start on our night-time photography path, at our August meeting, a number of the Society's members passed on their experiences and tips that they had gained over the years. If you decide to take the first steps in capturing the night sky then the more manual a camera you have the easier it will be. This may seem strange in a world brimming with digital cameras, where the mechanical types have been consigned to the scrapheap. But you will be taking long exposures of perhaps several minutes and a digital camera's battery will not take kindly to this. Although, there is nothing to stop you using a digital camera and you will be able to see the results much faster. If you are using a manual SLR you will need some print or slide film (100-400 ASA) and a tripod and cable release will help to keep your pictures sharp whatever format of camera you use. One of the easiest pictures to take is of star trails where you point your camera upwards at the sky and take long exposures; say, 10 then 20 then 30 minutes. Then take your pictures to a reputable photographic laboratory. The mass market developing and printing laboratories are not set up to print 'strange' photographs and will more than likely cut them in half or get the print exposures all wrong! The standard 50mm lens that comes with older SLR cameras is also ideal for taking pictures of the constellations. "The Plough" is available all year round and has several bright stars. Unless you want the stars to trail you will need to have shorter exposure times. Another good introduction to the field is taking photos of the planets. Venus, Mars, Jupiter and Saturn make very good subjects as they are bright. At certain times of the year they appear together in the night sky and you can capture several together along with the Moon. 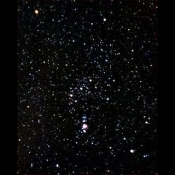 As you get more experienced you may try for trickier objects such as meteors, comets and aurorae (the Northern Lights). But whatever you decide on the main idea is to enjoy your photography and not to worry about making mistakes. If you make notes of aperture settings and exposure timings as you go along you will gradually learn what works for your camera and location. Whether you decide to take the digital route to capture your shots or test your skills with a manual camera, the sky is literally the limit. With patience and a modicum of equipment you can bring your night sky into the daytime.